Connection search and new design. New german "after-flooding" timetables are online. One is now able to give the maximum number of vehicle changes when doing the driving distance search. From today on Arrlee displays the connection details by itself without using the external railway sites. The german NGO ProBahn ("Pro Railway") published an article about Arrlee in their latest issue of "Der Fahrgast" ("The passenger"). We are happy to announce, that from now on the Arrlee time tables also contain the cable car date from our partner Alpentaxi. In addition our new connection search is online, still beta though. 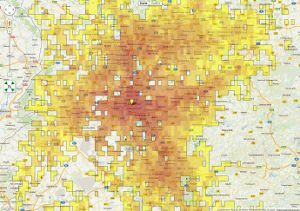 Swiss SonntagsZeitung published a big article (german) about Arrlee and our new Mobility-Index. We are taking an active part on the Open Data Camp on 30th and 31st of march. In addition to a presentation of Arrlee we are also contributing data! The newest version of Arrlee shows differently colored areas, depending on the time it takes to reach the area. The resulting look is similar to a heat map used for coloring images depending on their temperature. In our case, close areas are colored darker while for more remote areas lighter colors are used. In addition you can choose which color schema you want to use or if you prefer not have the map colored at all. Major user interface redesign: Stations and POI are displayed next to the map in list form, plus many small changes. We happy announce the mobile version of Arrlee: http://m.arrlee.eu! This online-version is optimized for smaller screens as they can be found in mobile phones and tablets like iPhone, Android-devices and many more platforms. Our partnership with Bergportal bears unique fruit: Almost all Swiss mountains and many mountains in Germany and Austria are now integrated into Arrlee and can be found via a proximity search. All listed summits are linked to the appropriate tours; in addition we also integrated picnic spots, Alpine huts and glaciers. We are happy to announce that Alpentaxi joined us as a partner. Built by the environmental organization Mountain Wilderness the portal offers information on cable cars, buses and taxi in the Alps. Most of these are not listed in any official time table but will help you get to the mountains in a fast and eco-friendly way. You can now bookmark search results and the current view and/or send it to friends. Arrlee is now available in English with more languages to follow. Usability has been improved with new data and faster loading. New data: A lot of changes backstage. Number of POI almost doubled, better routing calculation and integration of wikipedia. Online with new design. We hope you like it. Beta testing successfully finished. Thanks to all the helping hands!